Combine dry ingredient, then add water and oil. Knead till smooth & elastic. Let it rest for 2 hour. Place it on smooth surface and divide into 3 portion. Stretch each piece into round and place onto a greased pan. Preheat the oven to 160 Dec C. Meanwhile , do the topping and let it rest for 10 min. Once done, bake it for 20 min till golden. Spread olive oil all around the surface, followed by tomato paste. 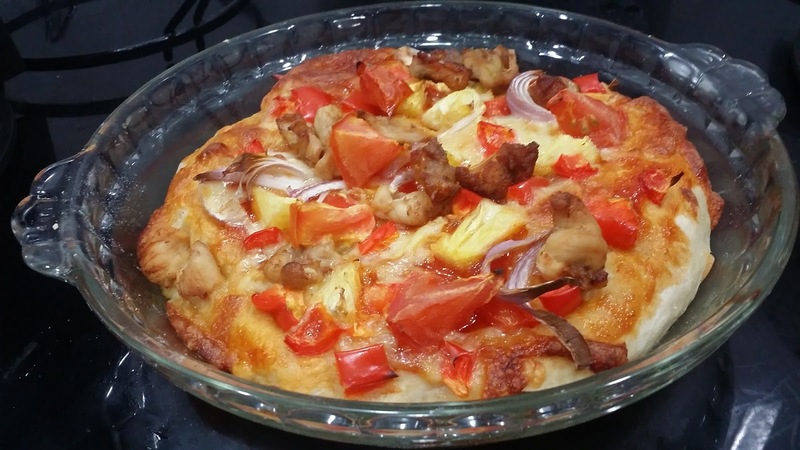 Sprinkle cheddar and mozzarella cheese, onion, pineapple, capsicum and fried chicken.